In the 1970's prominent movie stars credited the use of palmarosa oils for their flawless, ageless skin. Palmarosa essential oil, primary active compound is geranial which is valued for its multiple traditional medicine and household uses. 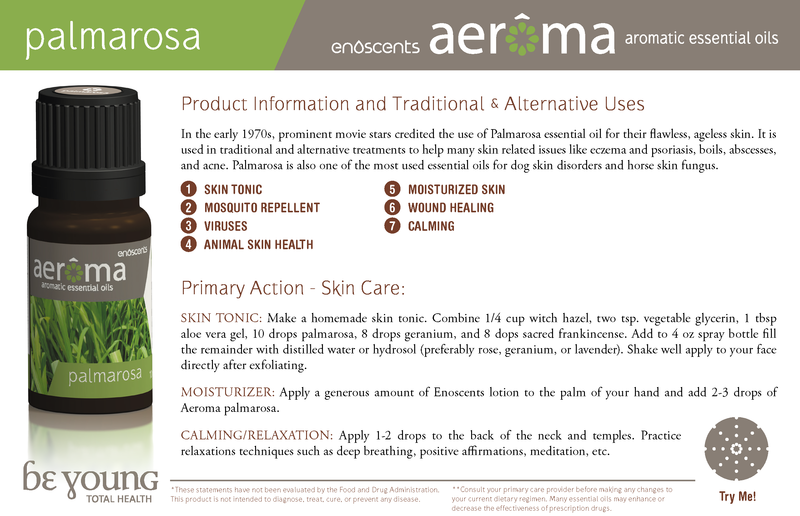 Research on palmarosa has indicated that it has a powerful wound healing properties for wound that are slow of healing. Additionally, researchers have praised palmarosa for its neurological protective propeties. In fact reseachers suggest its therapeutic potential in brain conditions. Immunostimulant : Palmarosa essential oil was found to have a significant immunostimulant activity on both the specific and non-specific immune mechanisms.(4). Neuroprotective: This study, for the first time, shows potent neuroprotective effect of Palmarosa (Cymbopogon martini) against global cerebral I/R-induced oxidative stress in rats, suggesting its therapeutic potential in cerebrovascular diseases (CVD) including stroke.(5). Wound-healing agents : The ingredients from essential natural oils were found to have wound healing effects on non-healing wounds that is interfered by elastase due to microbial infection. (6).